Many of these ancient Islamic masters’ writings were only in Arabic and used terms that were complex and unfamiliar to Western people. 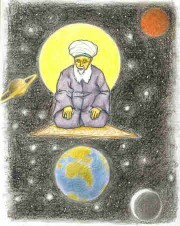 Such as Taffakur, Tadhakkur, Muraqaba, Muhasabah, Insan Kamel; by masters such as Imam Gazalli, Ibn Arabi, Hadrat Abdul Qadir a Gilani all the Saints of the Naqshbandi Sufi Way. This could not be taught without a Master like Shaykh Hisham Kabbani. Make fresh wudu and pray 2 raka’t (Tahiyatu’l Wudhu). Cleanliness is close to Godliness. See through Eyes of the Heart -Don’t look for a face, just his Aura/Spirituality Converse with the Shaykh, building your relationship with the reality of the Shaykh. Eyes Shut ask for Permission to connect his light to your heart and your light to his heart. Initially the mureed may begin the practice of Islamic Meditation/Muraqabah for short intervals of 5 to 15 minutes, and gradually work towards longer sessions extending even for hours at a time. The important point is that one maintain a consistent practice to obtain benefit. It is manifold better and wiser to keep to a small amount daily than to be sporadic in one’s discipline and practice. A small amount of effort done consistently will result in tremendous progress in even a short amount of time. Once a Day. When someone sits for Islamic Meditation/Muraqaba and closes the eyes, he focuses his mind on one single point. The point in this case is usually the concept of his spiritual mentor. That is, he focuses all his witnessing abilities concentrating in thinking about his spiritual teacher, in order to get the image of his mentor on the mental screen, as long as he remains in the state of Meditation. The properties, characteristics, and potentialities related to an image also transfer on the screen of the mind when the image is formed on the mental screen and the mind perceives them accordingly. For instance, a person is looking at fire. When the image of fire transfers on the mental screen, the warmth and heat of the fire is perceived by the mind. A person who is present in a garden enjoys the freshness and coolness of trees and plants present in the garden to create their image on his mental screen. Similarly when image of the spiritual mentor transfers on the screen of mind, the Presented Knowledge which is operative in the spiritual teacher, also transfers with it and the mind of the student gradually assimilates the same. بعض العارقين :ادخل الشيخ في قلبك و أسكنه فثه و لا تخرجه حتي تصير عارفا بسببه . Everyone must try within the rules which exist in their religion, to praise the Lord first, in the way the prophets taught us. We can then sit in a silent place, preferably in the dark, cover ourselves and withdraw from everything around us. We should not hear or feel anything, only think that we are one within the existence of the Lord Almighty Allah in the Divine Presence. Islamic Meditation Muraqaba, thinking about the spiritual mentor, an attempt to concentrate and focus our thoughts on someone, so that his image could recurrently reflect upon the screen of our mind, we are liberated from the limiting senses. The more frequently a thought is displayed upon the mental screen, the more vivid would be the formation of a pattern in the mind. And, this pattern of mind, in terms of spirituality, is called the ‘thinking approach’. When we imagine the spiritual mentor or ‘Shaykh’, as a matter of eternal law, the knowledge of Heavenly Attributes operative in the mentor or Shaykh is reflected upon our mind with frequent repetitions resulting in enlightenment of the mind of the spiritual associate with the lights functional in the mentor and transferred to him. The enlightenment of the heart of the spiritual associate attempts to reaches the level of his mentor. This state, in Sufism, is called ‘Affinity’ (nisbat). The best and tested way to enjoy the affinity, according to spirituality, is the longing passion of love. 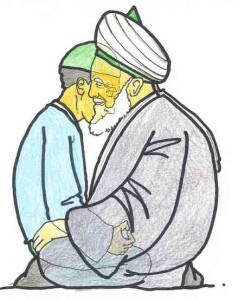 The mind of the mentor keeps on transferring to the spiritual associate according to the passion of love and longing for the mentor flows in him and there comes a time when the lights operative in Shaikh which actually are the reflections of Beatific Visions of God are transferred to the spiritual associate. This enables the spiritual associate to be familiar with the effulgent lights and Beatific Visions. 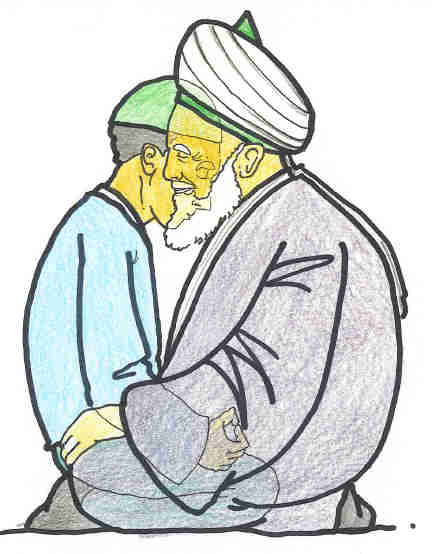 This state, in terms of sufism, is called ‘Be one with mentor’ (Fana fi Shaykh). The Lights of Shaykh and the refulgent Beatific Visions operative in mentor are not the personal trait of the mentor. Just as the spiritual associate, with devoted attention and concentration, assimilates the knowledge and the traits of his mentor, the mentor has absorbed the knowledge and attributes of the Holy Prophet (PBUH) with devoted attention and concentration of the mind. Shaykh stated that ash-Shaykh Sirr as-Saqati said “la tasahu ‘l-mahabat” love is not authentic between two until one says to the other “ma anta illa ana -You are me and I am you.” You cannot be in love until you say to the other “ we are one. You are me and I am you. Remember its not me that counts I am nothing, I and Me must vanish into He. My Shaykh , My Rasul , Leads us to My Lord.. 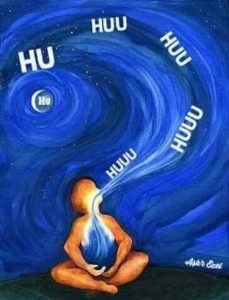 In the manner of the Naqshbandi Sufi Masters, demands that the seeker close his eyes, close his mouth, clench his teeth, glue his tongue to the roof of his mouth, and hold his breath. 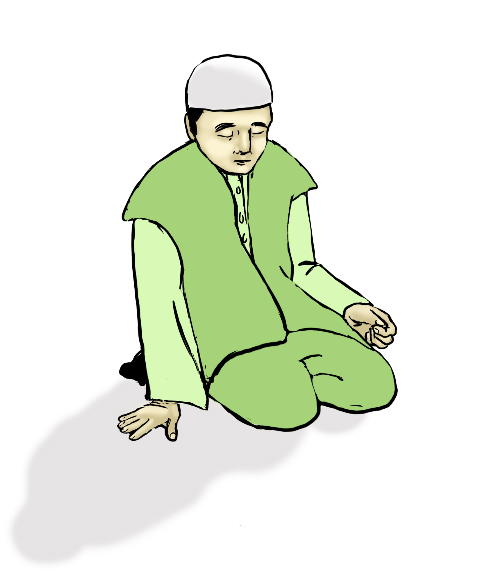 He must recite the dhikr through the heart, by negation and affirmation, beginning with the word LA (“No”). He lifts this “No” from under his navel up to his brain. Upon reaching his brain the word “No” Don’t use your head to reach realities. brings out the word ILAHA (“god”), moves from the brain to the Right shoulder, and Then to left shoulder where it hits the heart with ILALLAH (“except Allah”). When that word hits the heart its energy and heat spreads to all the parts of the body. The seeker who has annihilated all that exists in this world with the words LA ILAHA, affirms with the words ILa ALLAH that all that exists has been annihilated in the Divine Presence. 75:4 Yes. [We are] Able [even] to proportion his fingertips. 75:4 Bala qadireena ‘ala an nusawwiya bananahu. Left Hand “81” both add to 9 and two 9’s Make 99 . Hands are Dressed with Allahs Beautiful Names. 99th name of Rasul [s] is Mustafa (The Chosen One).. more later to come..
Qur’an is proving that your identity is connected to your finger print and has a tremendous importance. That you will be raised to the exact proportion of even your finger prints. Hands Carry tremendous secrets, they are like your satellite dish, make sure they are clean and in the proper position. So when you begin with the hands, when washing them and rubbing them to activate them, that is sign of 1 and zero, and you being to activate the process of what codes Allah has given us through the hands, you begin to activate them. They have nine bullet points that consist of the whole system, the whole body. When you rub the fingers you are activating the 99 beautiful names of Allah. b) By activating them you are activating the 9 points that are on your body. Hands are Dressed with Allah’s Beautiful Names. 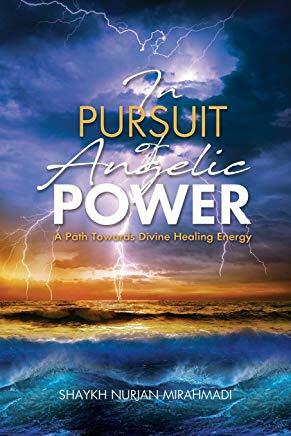 99th name of Rasul is Mustafa..
c) And when you activate them, You Turn on the receiver, energy is going in, it begins to work to be able to receive, digitize it and release it out as a picture and as a sound, as we are seeing today. imagine White light entering thru stomach. imagine Blackness carbon monoxide and all your bad actions being purged from you. The name ‘Allah’ which encompasses the ninety-nine Names and Attributes consists of four letters, Alif, Lam, Lam and the same Hah (ALLAH). The people of Sufism say that the absolute unseen Essence of Allah Exalted and Almighty is expressed by the last letter vowelized by the Alif, “Ha.” It represents the Absolutely Unseen “He-ness” of the Exalted God Safeguarding your breath from heedlessness will lead you to complete Presence, and complete Presence will lead you to complete Vision, and complete Vision will lead you to complete Manifestation of Allah’s Ninety-Nine Names and Attributes. Allah leads you to the Manifestation of His Ninety-Nine Names and Attributes and all His other Attributes, because it is said, “Allah’s Attributes are as numerous as the breaths of human beings.” It must be known by everyone that securing the breath from heedlessness is difficult for seekers. Therefore they must safeguard it by seeking forgiveness (Istighfar) because seeking forgiveness will purify it and sanctify it and prepare the seeker for the Real Manifestation of Allah everywhere . To make progress on this journey, the seeker must bring into his heart the picture of his Shaykh (tasawwur), as it is the most powerful means of detaching oneself from the hold of the senses. The Shaykh becomes, in his heart, the mirror of the Absolute Essence. If he is successful, the state of Self-Effacement (ghayba) or “absence” from the world of the senses, appears in him. To the degree that this state increases in him, his attachment to the world of the senses will weaken and disappear, and the station of the Absolute Void of Unsensing Other-than-Allah will dawn on him. The highest degree of this station is called fana (Annihilation). “The shortest path to our goal, which is Allah Almighty and Exalted, is for Allah to lift the veil from the Essence of the Face of His Oneness that appears in all creation. He does this with the State of Erasure (ghayba) and Annihilation in His Absolute Oneness (fana’), until His Majestic Essence dawns upon and eliminates consciousness of anything other than Him. 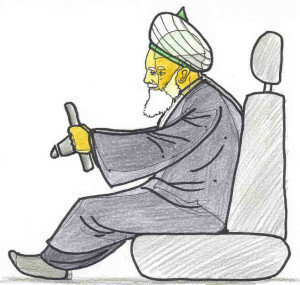 From Tariqats follow either the Tariq-i-Nafsani, the way on which first of all the Nafs, the ego, is educated in order for the soul to be saved, or they follow the Tariq-i-Ruhani, the way on which first of all the Ruh, the spirit or soul is purified. The Tariqa-e-Nafsani is heavy. Always you have to do the opposite of what your ego wants from you. It is a big fight. We have our love for him, so now wear his light and imagine everything from this point on, with that dress upon us. This is our life support. You can not eat, drink, pray, dhikr or do anything without imagining the Shaykh’s Image upon us. This Love will mix in with His Presence, and this will open the door of Annihilation in Him. The more one can keep remembering to be dressed with him the more Annihilation will take place. Fana fi Ma Shaykh, RasulAllah, Allah.. Annihilation Fana Islamic Meditation Muraqaba In the state of spiritual associate’s oneness with the mentor those abilities of the Shaykh become activated in the spiritual associate (salik) because of which the Shaykh enjoys the affinity of the Holy Prophet (PBUH). This stage, in terms of Sufism, is called ‘Oneness with the Holy Prophet’ (Fana fir Rasul). 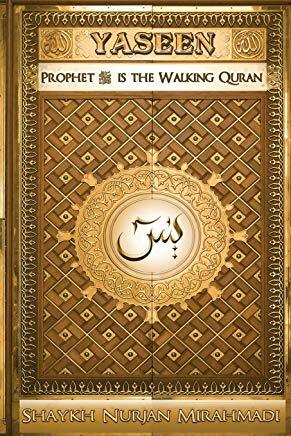 It is the holy statement of the Holy Prophet (PBUH), “I am a human being just like you but I receive revelation”. 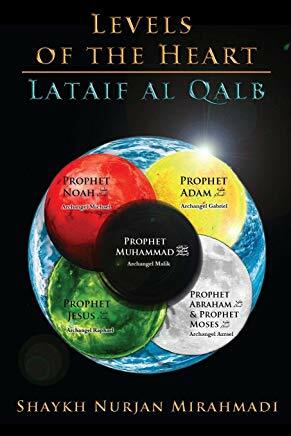 When this statement is closely examined, it is found that the exaltation of the Last Prophet is that he received Revelations from God, Almighty which reflects the Divine Knowledge (Ilm-e-ladduni); the knowledge directly inspired by God, the Beatific Visions of God and the refulgent Lights upon the blessed Heart of Holy Prophet. In the state of ‘Oneness with the Holy Prophet’ a spiritual associate because of his passion, longing and love gradually, step by step, assimilates and recognizes the knowledge of the Holy Prophet. Then comes that auspicious moment when the knowledge and learning is transferred to him according to his capacity from the Holy Prophet (PBUH). The spiritual associate absorbs in the traits of the Holy Prophet (PBUH) according to his aptitude, ability and capacity and because of his affinity with the Holy Prophet and his support, he manages to reach that state when he had acknowledged the Lordship of God, the Lord of the worlds saying, ‘Yes, indeed you are our Lord God! This affinity, in Sufism, is called Annihilation in Allah Love’ (Fana fil-lah) or simply ‘oneness’ (wahidyia). After that, if one is bestowed with ability one explores those areas about which narration has no words to explain them because of their delicacy and subtleness. To Be, a thing non-existent, crystal clear vessel for Your Lords Heavenly Service. In the state of ‘Oneness with the Holy Prophet’ a spiritual associate because of his passion, longing and love gradually, step by step, assimilates and recognizes the knowledge of the Holy Prophet [s]. 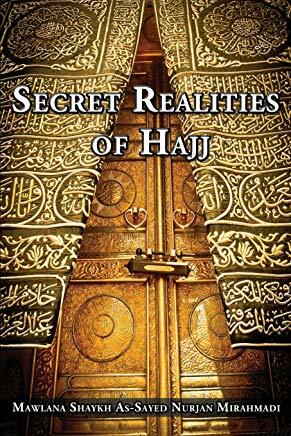 Shaykh Kabbani began to open these realities in an easily digestible manner for the Western audience. “The Prophet [s] said, “The Sun would Rise from the west “ That Sun is the Sun of Sayyidena Muhammad [s] and the guidance of The Sultan al Awliya Muhammad Nazim al Haqqani [Q]. The greatness of Mawlana Shaykh is that he offers many flavors for all people and teaches us to Teach Khair – goodness and love. The goal and purpose of Islamic Meditation Muraqaba Muraqaba/Meditation/ Rabita Sharif is to manifest perpetual presence in the reality of the Shaykh. The more one keeps to this vital practice, the more its benefit will manifest in his daily life to the point that he reaches the state of annihilation in the presence of the Shaykh. One must know well that the Shaykh is the bridge between illusion and reality and he remains in this world only for this purpose. The Shaykh is thus a unique rope extended to anyone who seek freedom for only he may serve as the link between one still mired in this world and the Divine Presence. What purpose does meditation serve, and how can we reach such a state? It is mentioned in all our Holy Books: the Torah, the Gospels and in the Holy Qur’an, as a method to reach the Divine Presence. When we come face to face with our Creator, we leave everything else behind. Nothing remains except your soul. Even if I tried to cut you with a sword, you would not be harmed. Nothing can touch you physically in such a state, because your physical body will have entered your spiritual being. Normally it is the opposite: our souls are imprisoned in the physical body.